A Day off is a Glorious Thing was posted on October 30th, 2014 and is filed under Life, Low Carb. This entry has 3 comments. You can follow any responses through the RSS 2.0 Comment Feed. Note: This post is from a few days ago. Unfortunately I have been having problems with my internet so I couldn’t upload it. Thank goodness it’s fixed! I love having a day off, it’s so great to just catch up. I’m one of those people that rush in and out all day long…and to just sleep in a little bit was lovely. I started today off with one of my favourite breakfasts! My low carb cream cheese pancake. Sigh. It never gets old. Instead of pairing it with my usual Starbucks dark roast, I made some Teavana Oprah Chai and added a little vanilla stevia and cream to it. I love that this whole breakfast was sugar and carb free, but it tasted so decadent! The rest of my morning was grocery shopping (which is relaxing for me!) and then did some cooking. I found out that one of my brothers was working in the area, so I made this Low Carb Alfredo Bake and had enough to put away for a few lunches. After some cleaning and catching up, I tried to find a costume for myself for Halloween. To be honest, I’m not really into Halloween at all. In fact, it’s not my thing at all. However, I have a friend who is putting on a Disney only costume party…and I really can’t say no to that. I’m thinking Giselle from Enchanted, the Mad Hatter, Alice, or Rapunzel. I can’t decide…so I need help. I also noticed in the mirror this morning, that there is still paint in my hair. A few days ago I helped one of my friend’s paint…and after he rolled the ceiling, I took one step too high on the ladder and bumped my head on the freshly painted ceiling. It hasn’t come out. There’s talk of butter taking paint out of one’s hair…but I haven’t done it yet. Maybe I’ll try coconut oil. Speaking of oil…I also just made a fresh batch of oil facial cleanser. I remembered how great it was when I used to do oil cleansing on my face…and decided it was time to get back into the habit. If you’re curious about it, you can check out this beginner’s guide to oil cleansing. Anyway, enough of lazy, day-off ramblings. I’m going to spend the rest of the day with one of my siblings…. …Cuz that’s always a good time, says Carly Ray Jepsen. Disney costume ideas? How do you get paint out of your hair? 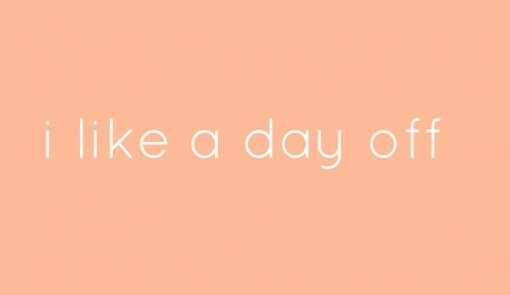 Favourite way to spend your day off? That pancake looks freaking delish!!! That alfredo bake looks delicious!